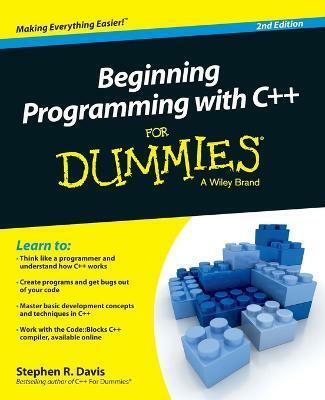 Learn to program with C++ quickly with this helpful For Dummies guide Beginning Programming with C++ For Dummies, 2nd Edition gives you plain-English explanations of the fundamental principles of C++, arming you with the skills and know-how to expertly use one of the world's most popular programming languages. You'll explore what goes into creating a program, how to put the pieces together, learn how to deal with standard programming challenges, and much more. Written by the bestselling author of C++ For Dummies, this updated guide explores the basic development concepts and techniques of C++ from a beginner's point of view, and helps make sense of the how and why of C++ programming from the ground up. Beginning with an introduction to how programming languages function, the book goes on to explore how to work with integer expressions and character expressions, keep errors out of your code, use loops and functions, divide your code into modules, and become a functional programmer. * Grasp C++ programming like a pro, even if you've never written a line of code * Master basic development concepts and techniques in C++ * Get rid of bugs and write programs that work * Find all the code from the book and an updated C++ compiler on the companion website If you're a student or first-time programmer looking to master this object-oriented programming language, Beginning Programming with C++ For Dummies, 2nd Edition has you covered. Want to get started with programming but don't know quite where to begin? This complete guide to learning C++ programming will help you start your journey! Learn to walk the programming walk while figuring out how to use C++, install and use the compiler, work with loops, grasp objects and classes, and write real programs that work. Visit the companion website at www.dummies.com/extras/beginningprogrammingcplusplus for code from the book and an updated C++ compiler. Stephen R. Davis is the bestselling author of numerous books and articles, including C++ For Dummies. He has been programming for over 35 years and currently works for Agency Consulting Group in the area of Cyber Defense.